Lowdown: An American civil war veteran finds himself in the thick of a civil war on Mars. The main thing everyone knows by now about John Carter is that the film's one of the biggest financial flops ever in the field of cinema. It therefore raises the question of why; hence me watching it. After all, as bad as it probably is, it is still a science fiction movie filled with special effects. There shouldn't be too much suffering involved, right? Actually, I found the beginning - or rather, the first hour or so - to be quite intriguing. After a short exposition we follow John Carter (Taylor Kitsch), an American civil war veteran coming from the losing side. Generally disenchanted with life and everything, he finds himself in the middle of a conflict between northern soldiers, Indians and himself. A conflict from which he's rescued through a mysterious event that sends him all the way to Mars. Carter's Mars is different to the one science is now telling us about. It is brimming with life, both monster like and humanoid like, with the humanoids embroiled in a war between two sides that happen to be conveniently divided into red and blue. Thus a more than coincidental analogy to the USA's Democrats vs. the Republicans, with, it has to be said, the film heavily leaning towards the Democrat side. At least that's where the pretty token female role is and thus where Carter's heart leans; the Republicans, on the other hand, are manipulated by a bunch of mysterious weirdos wielding magical powers (led by Mark Strong) that happen to be the true baddies of the film. Alas, after the movie gets into gear it seems to lose the plot. Everything turns uninspiring, predictable, and - well - standard. 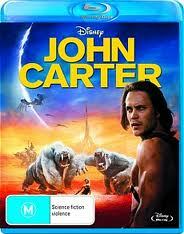 John Carter turns into a film of a type we've watched many times before, a film demonstrating the weakness of contemporary Hollywood: no creativity, but lots of uninspiring, special effects driven action scenes. Throw in an ending that no really an ending but more like a setup to a sequel that by now we know is never going to come, and you got all the ingredients of a proper flop. Overall: Redundant and uninspiring. 2 out of 5 stars.